It’s rare that I eat at a place twice before I blog about it. But I also rarely eat at a new place twice in a five day span. 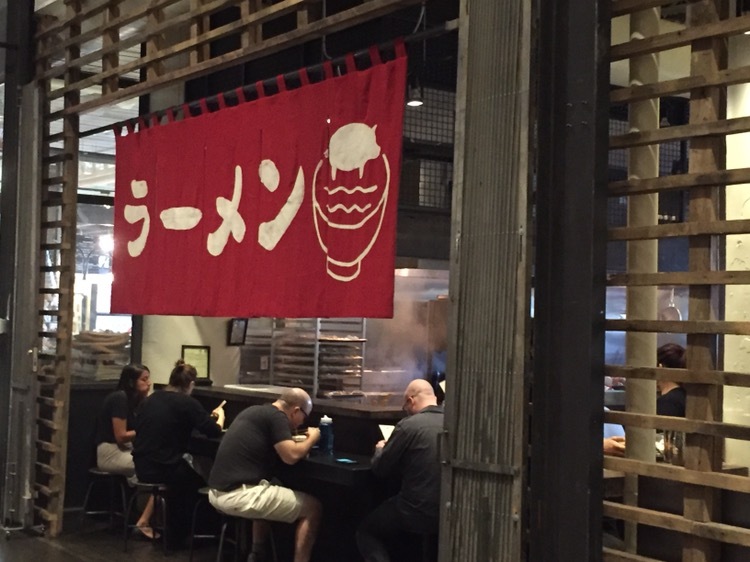 As one of the newest spots to open in Ponce City Market, I’ve been waiting for Ton Ton Ramen and Yakatori to open ever since I first heard about it. I love ramen. 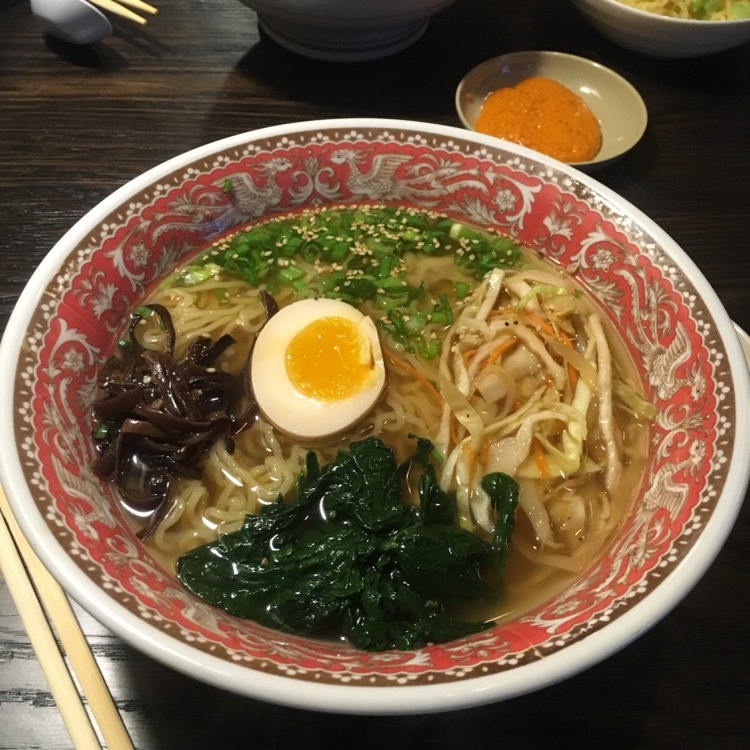 Having Guy Wong open a noodle place in the ramen wasteland of downtown is a double win. I’m a big Guy Wong fan, enjoying both Miso Isakaya and Le Fat. Below, you can see him overseeing every bowl coming out of the kitchen, on my first visit. That day, I took a seat at the bar in the photo above and looked over the menu. At four entrees, that didn’t take long. All of the dishes are noodle based, three of them with broth. Apparently the yakatori – skewered meats, mostly, grilled over charcoal – is yet-to-come-i. When I asked about the spiciest, the server suggested the Invincible Dan Dan Mazeman, which is the one dish without broth. But she said I could add the chili paste bomb to any of them. 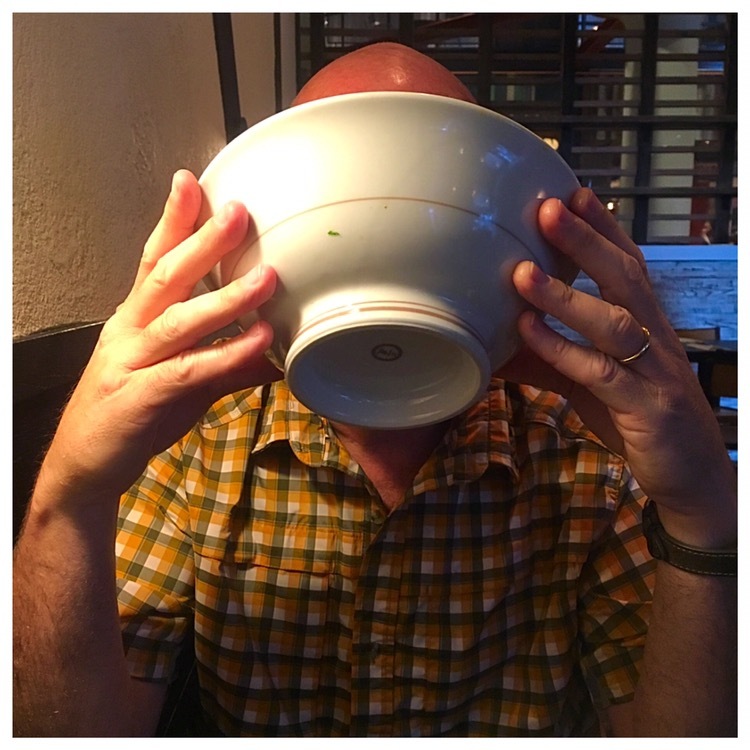 That made it simple – I ordered the hakata tonkotsu, with the chili paste bomb. The bomb was not the gelatinous globule of heat that I imagined it would be (I was thinking of something like a bath bead, for some particularly odd reason), but rather was in the small dish next to my ramen. I tasted it and, holy cow, it was the bomb! 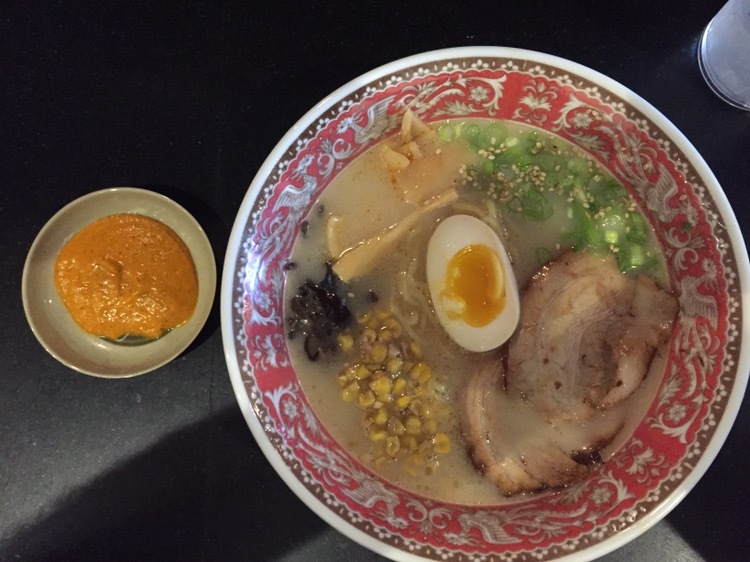 It added a huge dose of heat, especially when I failed to stir it into the broth sufficiently Once I got it evenly distributed, a sweet corn kernel in a spoonful of spicy broth was absolutely heavenly. The meal was delicious. And I even met Noel, one of the podcast producers at How Stuff Works, who was eating down the counter from me. 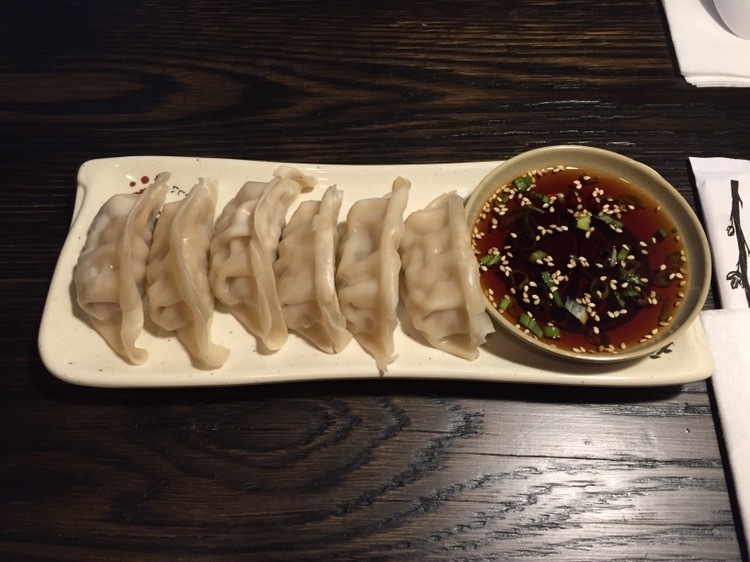 So we went back on Sunday (so my better half could experience it) and started off with the pork gyoza – steamed dumplings. My beloved really enjoyed the taste of these dumplings, and I agreed on that point. But I do prefer dumplings that are pan fried for that extra “crunch”. I had the hakata tonkotsu, again, and my table mate had the yasai (mixed vegetable) ramen. According to her, the only way to improve this dish (other than adding the chili paste bomb – which she did, judiciously), would have been to add another egg, for additional protein. I was forced to Google and see what the deal was and found that this was perfectly acceptable. That’s because there are no hard and fast rules about how you should eat ramen. 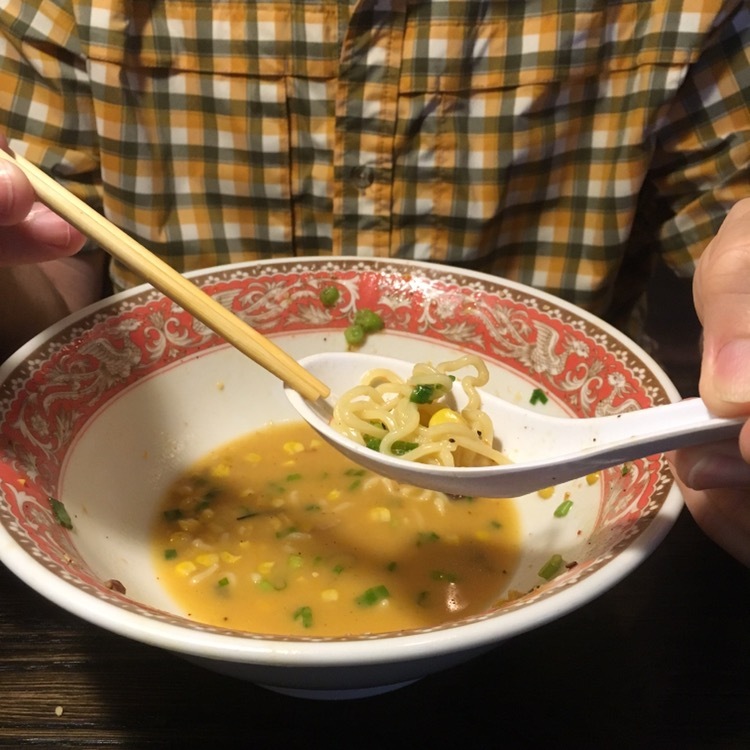 The one concensus was that you should finish your bowl like this.